So I've officially joined the bandwagon of cheesy fall-themed titles. Can you blame me? Despite my dislike for cold weather, I can't help but get excited for the season of pumpkin everything and cozy sweaters. Since the afternoon temperatures are still lingering between those of summer and fall, I've styled a transitional outfit for today's post in collaboration with Skechers. Yes, you read it right -- those are Skechers on my feet. You might associate the brand with those cool kid sneakers from your childhood that lit up with every step. Fortunately, Skechers still has great products for those of us who have outgrown the infamous light-up shoes. In the spirit of the new season, I've gone boho in these slouchy tan lace-up boots. I especially love that the laces are intentionally wrapped around the shoe for easy wear and a gathered look unlike most combat boots. Pair them with a layered neutral outfit, and you're all set for an easy autumn day. Great post! The dress underneath is so cute! Love this outfit for transitioning to fall! I would have never guessed that those shoes were from Sketchers! They're so cute! And who doesn't love fall puns? Fall's only a quarter of the year! Haha, have a lovely week, Christina! Agreed!! It's a nice change for them. I hope you've had a lovely week as well! love the muted tones!!! great bag and boots!!! awesome for fall! 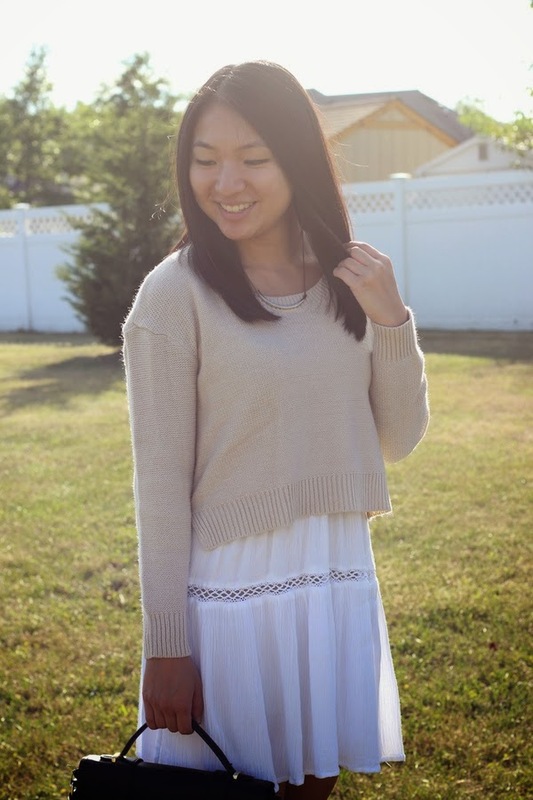 Cute fall outfit- I love the dress detailing that peeks out underneath the sweater! Also, I love that your shoes are Sketchers! I bought a pair of studded booties and some cute wedges from them the other month and it only set me back about $30. I love them! Everyone's jaw drops when I talk about how many cute non-lit-up-sneakers shoes Sketchers carries. And so inexpensive, too! Thank you so much!! I totally agree -- I haven't checked out Skechers products in a long time, so this is a nice change for me. Hope to see your shoes in a post soon!